Moss & Barnett is pleased to congratulate Kevin M. Busch who was awarded a Civilian Award of Commendation by the Metro Transit Police on June 5, 2014. 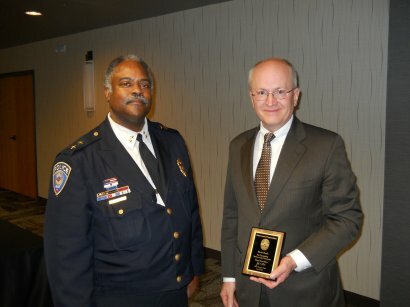 The award was presented by Metro Transit Police Chief John M. Harrington. Kevin serves as the firm’s Chief Operating Officer, is chair of the firm’s banking and commercial transactions practice area, and is a member of the firm’s business law and mergers, acquisitions, and corporate finance practice areas. The Metro Transit Police department is a vital component of Metro Transit and the Metropolitan Council. Transit Police ensure the safety and high standards necessary to attract ridership and maintain an environment conducive to a healthy, vibrant transit system. For more information, please visit www.metrotransit.org.